Pocket pack tissue holders are my current favorite sewing project. They are a great way to use fabric scraps, and they're a nice handmade gift or stocking stuffer that is truly useful. They're also super easy to make and therefore an ideal project for the beginner sewist (or the pro who wants a break from complicated projects). The ones I make hold a pack of tissues and have a pocket to hold a small bottle of hand sanitizer (or lip balm or sunscreen or any other little necessity). At the opening for the tissues, there is a slight overlap, which keeps the holder from gaping open. Here is the tutorial. To begin, select your fabrics. Quilting cottons, broadcloth, or similar fabrics work best. You can use one, two or three coordinating solids or prints. 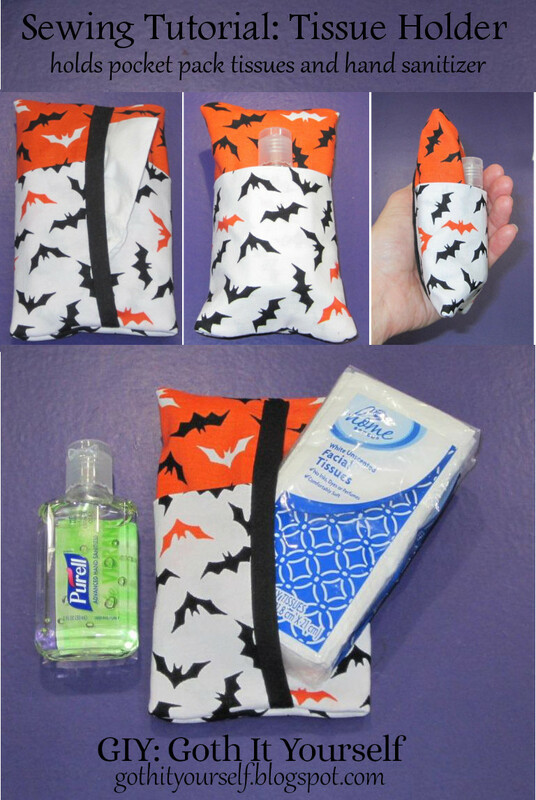 In this example, I used solid black for the inside/trim, orange bat print for the outside, and white bat print for the pocket. Fold the pocket fabric in half horizontally and press. Place the pocket fabric face up on top of the outside fabric face up, matching the raw edges at the sides and bottom. On top of this, place the inside/trim fabric face down, matching the edges at the left side, top, and bottom of the fabric stack. Stitch along the left side (about a .25 inch seam). Slide the inside/trim fabric to the left, and match up the edges at the right side, top and bottom of the fabric stack. Stitch along the right side. (Not shown, optional: Finish the raw edges with a serger.) You now have a loop of fabric. Turn the loop outside out. One side will show the inside/trim fabric. The flip side will show the outside and pocket fabrics with a bit of the inside/trim fabric. Flatten the loop so there is an equal amount (about .5 inch) of inside/trim fabric to the left and right of the outside and pocket fabrics. Press. With the outside and pocket fabrics facing up, fold one edge of the flattened loop toward the center 2 inches. Fold the other edge toward the center 1.75 inches. Stitch along the top and bottom. If desired, finish the raw edges with a serger. Turn outside out. Push out the corners to shape. (If you serged the seams, the corners will be more rounded than pointy.) Done! That looks simple enough to sew by hand! 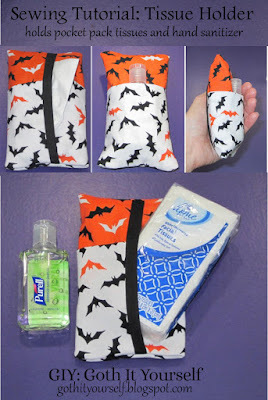 I need to make one because I can never find the tissues at the bottom of my bag when my nose is runny. Is this your "things with wings" project? I have another idea for my "Things with Wings" project, but this one is a good backup if it doesn't go well. I think I may need to dust off my sewing machine as soon as my wedding projects are done. :) Thank you so much for sharing this! One day, I'll muster up the courage to take on sewing projects. Looks like you've got some great stocking stuffers going, hah! Indeed. If only I had 20 stockings to stuff. ;) I really don't know what I am going to do with so many. Thanks Bane! I've wanted to make one of these for some time. I have two already, but they are too small for the pocket packs of tissues. Uh oh, I may need to fire up the old sewing machine! !